I remember it was a beautiful Fall weekend full of sunshine. I remember holding her hand while we walked into the restaurant. I remember how good the milkshake tasted. I remember the excitement they both felt not having school that Friday. I remember calling up to Anna and telling her we needed to head outside to watch the homecoming parade that was just about to start. I remember appreciating our small town and its small town traditions. I remember filling our pockets with candy. I remember thinking Abigail was definitely a pre-teen, all she wanted to do that weekend was spend time with her friends. I remember feeling blessed that she had such great friends. I remember walking up to the pumpkin patch, hearing them argue, turning around and telling them we may need to go home if they didn’t stop. I remember laughing while I watched Tom race the girls around the track riding tiny tricycles. 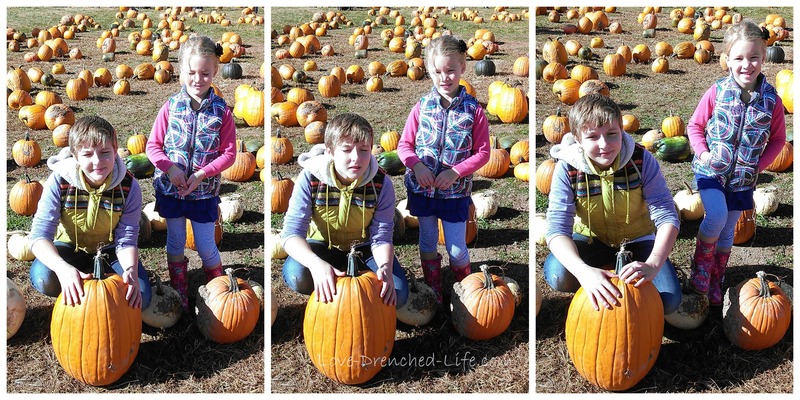 I remember telling the girls, again, to stop arguing as they fought over who was going to stand next to the big pumpkin for the annual pumpkin patch picture. I remember telling them that in the end they were sisters and they would always have each other – so stand next to the pumpkin and smile. I remember Anna standing on the front of the cart as we did our weekly grocery shopping as a family. I remember Abigail trying to sneak her favorite snacks into the cart. I remember taking more than one spoonful for myself. I remember doing yard work while Anna played in the fairy garden. I remember how excited she was to have a surprise visit from her friend for a spontaneous playdate at the park. I remember grounding Abigail from her phone for having a pre-teen moment. I remember how excited she was that we were letting her go to the corn maze with her friends, without her phone of course. I remember how excited she was when she came home with stories of teenage fun. I remember picking Anna up from her friends house after a birthday party, some Fall fun and a smores in the backyard. I remember that she didn’t want to sleep over at her friends house but rather cuddle up with me that night. I remember learning how to salsa dance with Tom thinking that our girls would be proud and totally embarrassed. I was excited to show them our latin moves. These memories are my most vivid of my girls. These are just a few of the last memories I have from their last weekend here on earth. It was such a full weekend filled with laughter, smiles, friends, arguing, ice cream and family. My heart is extremely heavy and I feel the water getting deeper. Jet lag, transitioning from a third world country to back home and the up coming anniversary of our girls Heaven Day is taking its toll. The distance from these memories of our last weekend together is getting greater. I will hold on tight though. I will always remember, always share and I will cherish every moment we had together. God has gotten us this far and I fully trust He will guide us the rest of the way until we are home, broken heart and all. I just wish I could have my old life back and not have to live this life without my girls. Wow! All those memories are from just one weekend?! That is a lot of fun, life and love experienced in a short amount of time! There is no doubt that Anna and Abby knew that they were deeply loved and accepted. I’m sure it’s that love and that unique family bond that inspired Anna’s sweet and simple poem of pure happiness. You are blessed and a blessing. Thank you for sharing so much of your heart and love. I know our creator and your girls are smiling on you and Tom every day. You have touched so many lives. Thank you for all your love and blessings in the world. I wish you could have it back, too. I wish you could simply hold them. I wish I could make it go away. pray and rejoice over memories and needs. and share that faith with all. Praying for the Peace of the Lord to fill and comfort you more than ever. Who knew that year ago our lives would change so drastically. I can clearly remember the dance off and her huge smile as we high-fived at the end and harassing her for beating me and challenging her to a re-match. The laughter was great and then both of us telling you about it at the end. I remember leaving the district office on Friday and seeing Abigail and her friends at the homecoming parade and telling her to have fun! As Monday approaches my heart grieves for you and Tom and everything that you have gone through. I pray for God to continue to lift you both and wrap his protecting arms around you. You made such sweet memories with your girls! And they loved spending time with you so much! I remember talking about having Anna come over and play while you ran some errands on this Friday one year ago. But she decided she really wanted to spend the whole day with you…even if it was running errands. So sweet! So much love! Sending lots of love and prayers for you and Tom! I wish that for you with all of my heart. Love you so much. Praying for you and Tom. Thinking of you and Tom every day, praying for God to continue holding you in his grace. So many loving you and holding you up in prayer. God bless you both. As with everyday that has passed I have prayed, but this last month I have prayed the hardest. There is nothing I could say that hasn’t already been said these past 12 months. We love you both. And even though I didn’t get a chance to know your girls very well..I love them too. I talk to them often and ask them to watch over you and when you feel the water getting deeper, I ask them to come visit you. Your posts keep your girls close and the rest of us get to know and love them more each day. Thank you for sharing your memories. Love you so very much. I feel sad and wish they were here too. I wish their time on earth had been longer. I have been thinking of you and Tom today and asking God for extra peace today and throughout the next many days. Reading your posts breaks my heart as I can only imagine the pain you are going through. I don’t know you personally or have memories of your girls to share with you to ease your burden. I can only hope that you are comforted in your unwavering trust in your faith and know that it will pull you through these days, months and years ahead. You are so blessed to have your family and friends who love you and are by your side everyday, god bless you and Tom and your sweet angles watching over you. Susan, God led me to your blog several months ago. I have never commented, but I just want to tell you now what a huge impact you and your girls have had on my life. I pray for you and Tom so often, and lift you up to the King of Kings especially in the coming days to surround you with His peace and comfort, His love and joy. You are loved, even though we probably will never meet face to face. Sending cyber hugs to you! We are all holding on tight with you. At this time last year, Abby and Grace were upstairs ‘playing’ dolls. Except not really playing because that wouldn’t be a cool thing to call it. Dressing them up and taking photos of them posed in front of different backdrops. They were having fun and got loud enough to wake up a napping baby and I remember being grouchy with them. But also grateful that Grace had a friend she could still ‘play’ with. They came downstairs and entertained True until it was time to get ready to walk to the parade and tap. They took their own sweet time and ended up barely making it to the tail end of the parade. They did manage to get to tap early enough to sit in the back room and talk to an older girl about what it would really be like in junior high. I remember picking them up from tap….one of the few classes Grace had been able to attend at that point in the year…and feeling so happy to see them dancing side by side. Grace was so excited to have Abby in her tap class. I remember the look on Abby’s face when I told them the pizza we were having for dinner had pineapples on it….and that she didn’t make a fuss when I suggested she pick them off. I remember our group hug in my living room that night before we went to the Girl Scout meeting. Am so grateful for that group hug. I wish your girls were here with you also and, selfishly, with all of us. I wish it every day. Hold tight to those memories, they will help you more as time goes on. Wishing I could be there with you right now. Nothing else I can say except how much you and Tom are loved.